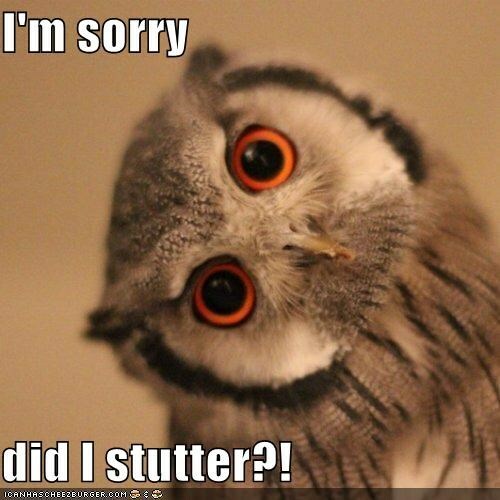 I work with a guy who has a pretty heavy stutter. I had a speech impediment as a kid and remember feeling embarrassed by it, so I don’t want to make him feel awkward. Is there anything I can actively do to make sure I’m not making him self conscious? Victoria: So I have had friends with stutters, so I am pretty good with this. Jaya: Oh good! Because I have no idea. Victoria: Basically you just wait. It makes people, in my experience, much more nervous if you try to guess what they are going to or react to it at all. Jaya: Yes, that brings a lot more attention to it and if you get frustrated, it usually makes the stutter worse. Victoria: Yep! So I would just wait patiently and maybe glance around slightly so you aren’t STARING at them. Jaya: Yeah. Like, be natural. Omg that’s always the worst advice though. Nothing makes you more unnatural than trying to be natural. Jaya: Like “oh just make normal regular eye contact that’s not too intense.” But yeah, I’d think you just don’t want to draw attention to it, unless the person actually asks for help somehow. Also so much advice focuses on telling people not to finish stutterers sentences. WHO IS DOING THIS?? WHAT IS WRONG WITH YOU?